Mouser Electronics, Inc., the industry’s leading New Product Introduction (NPI) distributor with the widest selection of semiconductors and electronic components, is now stocking FS1012 and FS2012 MEMS-based flow sensor modules from Integrated Device Technology (IDT). The innovative solid-state sensor element design eliminates cavities and diaphragms typically found in similar devices and features a protective silicon-carbide coating, making it a robust and reliable flow sensor element compatible with food-grade applications. 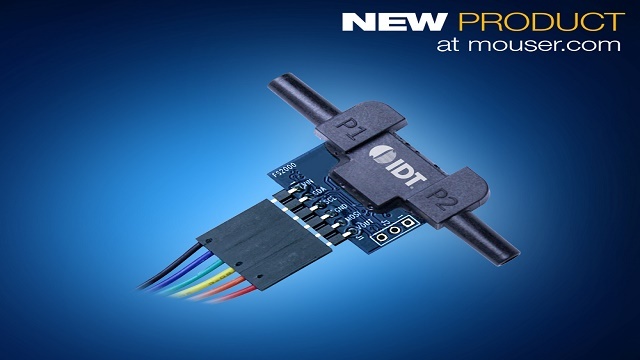 The IDT FS1012 and FS2012 modules, available from Mouser Electronics, are high-performance flow rate sensor modules suitable for both liquids and gases. The flow sensors utilize a series of MEMS thermocouples, which provides excellent signal-to-noise ratio. The solid thermal isolation of the active MEMS sensing element along with the silicon-carbide film coating offers excellent abrasive wear resistance and long-term reliability. The FS1012 is an uncalibrated standalone flow sensor module with a supply voltage of 3 V to 5 V and an analog millivolt output. The FS2012 is a fully calibrated version of the FS1012 flow sensor, featuring a digital I2C output and analog 0 V to 5 V output plus temperature compensation circuitry for plug-and-play usage in complex digital systems. The FS2012 module offers accuracy down to 2 percent of the measurement reading, providing high-accuracy in high- or low-flow situations using the same sensor module. With no moving parts and no fragile diaphragm over a cavity, the sensors eliminate clogged sensor elements and fluid pressure sensitivity, provide excellent shock resistance, and prevent chemicals from damaging the sensor element. The IDT FS1012 and FS2012 modules are ideal for use in medical, industrial, and food-grade consumer applications where reliability, robustness, and protection against cross-contamination are critical factors.